The Chief Joseph / Crazy Horse 3-D Book is a new release with 3D images, text and maps to illustrate the important historic sites and story of these two famous Indian leaders. 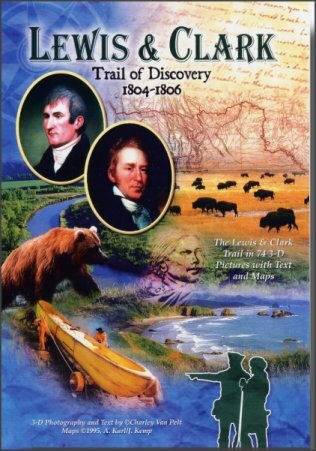 While shooting the 3-D images for the Lewis & Clark / View-Master® series, I frequently crossed paths with historic sites related to the Indian conflicts of the late 1800's in the Great Plains and the Northwest. Two names regularly stood out—Chief Joseph of the Nex Perce and Crazy Horse of the Sioux. Each was an outstanding leader—both with a common goal of protecting their people and homeland from the increasing western migration of the white man. The combination of scenic and historic sites that would produce interesting 3-D photo possibilities, and a great story to go with the images, prompted me to embark on this challenge. To make a long story short, I did the research and spent several weeks doing the 3-D photography. The result is a new 36-page, soft-cover book with 54 3-D pictures, plus text and maps, highlighting the locations and events surrounding these two great Indian leaders. Chief Joseph and his Nez Perce band were driven from their ancestral homeland in the Wallowa country of northeastern Oregon. The 3-D images trace the route of their 1700-mile flight through Idaho and Montana and their ultimate surrender on October 5, 1877, at the Bear Paw battlefield site—40 miles short of their goal of sanctuary in Canada. 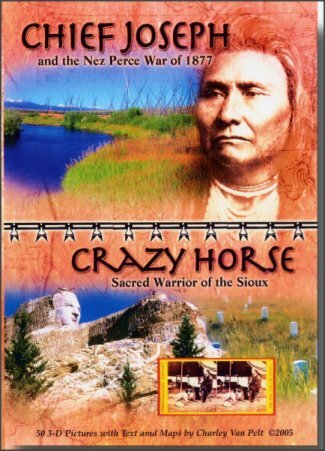 Crazy Horse was sacred to the Lakota (Teton Sioux) and for some 20 years led various Indian factions in their fight to retain their homelands in the great plains of the upper midwest. His best known, and last major encounter, was the Battle of the Little Bighorn, June 25, 1876. Lt. Col George Custer and his immediate command of 225 men were all killed at Last Stand Hill. The rest of the 7th Cavalry command, led by Major Marcus Reno and Capt. F.W. Benteen, were badly decimated. The five Indian tribes won the battle—but lost the war. Their final subjugation was swift and complete. The 3-D books are $5.00 each. The LOREO 3-D Viewer is $2.00 when purchased with a book, or a combined price of $10.00 for all three items.